Bread does not go bad due to becoming dry. Instead, it becomes bad due to transformation of starch to another form. 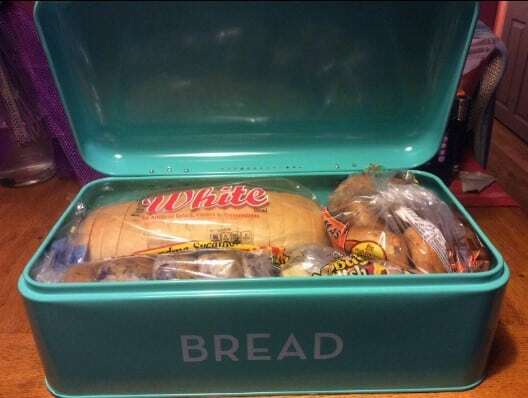 You can prevent the starch from getting bad by storing the bread in a bread box. How Does a Bread Storage Box Work? A bread storage box helps to prevent the homemade bread from getting into contact with air that is at room temperature. As a result, the starch will maintain its form for longer, which means the bread will not go stale quickly. Bread storage units are designed to keep out air, which is important in preventing the growth of molds. Moreover, you can store your bread in the boxes to keep pests from reaching them. Storing your bread in a bread box will lengthen its shelf-life. There are different types of bread boxes on the market. Some have lifted-style doors while others have roll-top doors. The boxes also come in different styles, including modern and vintage. Below is an overview of the top rated bread storage boxes on the market. The Wesco Grandy Bread Box features a blend of contemporary and vintage design, which will look great in any kitchen. The box is made of high-quality powder-coated steel and is durable. The heavy bread storage box has a swing top attached to metal hinges that are easy to open with a metal handle. At the back of the Wesco Grandy bread storage box, there are holes for letting in air to keep your bread fresh. The box has enough space for your baked goods such as loaves, doughnuts, muffins, and rolls. However, the paint on the edges of the swing-top door may chip over time. Moreover, the box takes quite an amount of space since it’s large. Overall, this is the best bread box for homemade bread. The Brabantia Roll Top is a sleek, modern box that will keep your bread fresh for longer and out of reach of pests. The bread storage box is large enough to fit two loaves of bread and is made of durable stainless steel. This smudge-proof bread box is also compact and will fit any kitchen counter. The Brabantia bread box comes in various shades of red, silver, and white. Coming to size, you can choose either a medium or large box, depending on your needs. 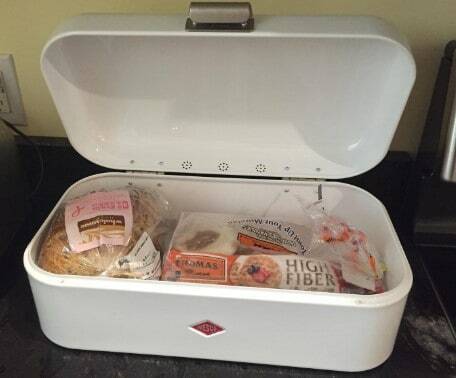 The bread storage box has a roll top door that saves space and keeps it compact. 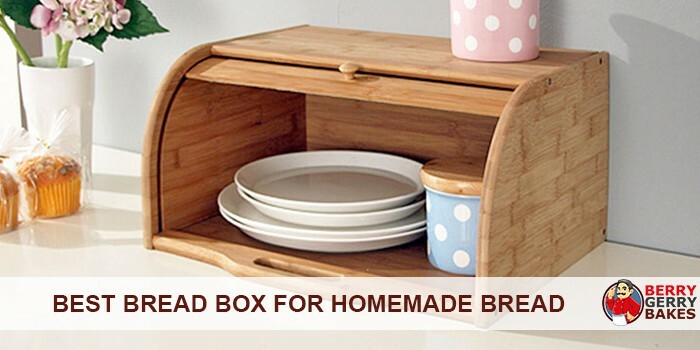 If you have a galley kitchen or live in a tiny home, this bread box would be perfect as it does not take a lot of space. However, we do not recommend this bread box if you live in an area with warm climate area. The warm climate can make the metal body attract moisture and heat your bread, making it go stale faster. 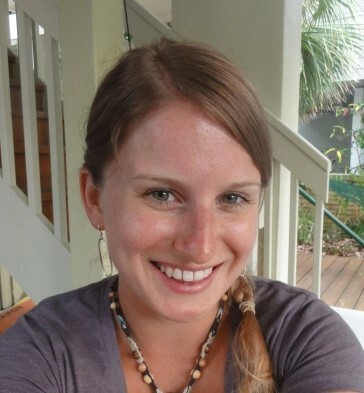 This concern only applies to people that live in areas with wet climate. If you live in an area with normal climate, the Brabantia Roll Top bread box would be an excellent buy. Other concerns we have is that the bread box has plastic handles, which are not very sturdy. 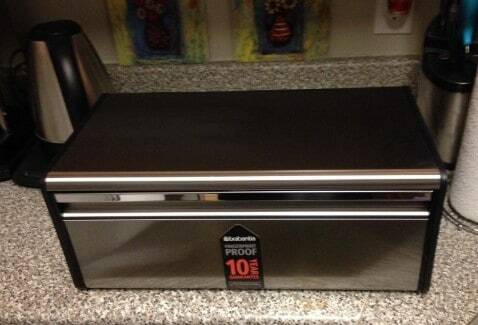 Finally, the bread box may move around easily on the countertop since it does not have rubber feet. 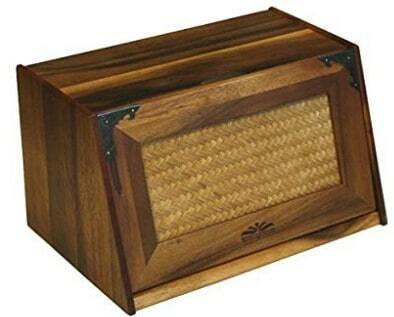 If you are looking for the best wooden breadbox, get the Mountain Woods Extra Large Acacia Wood box. This gorgeous bread bin features a rustic antique design and has a magnetic, flip-down door with metal accents. The box is compact and, therefore, will not take a lot of space on your countertop. The Mountain Woods is made from acacia wood and is a dream box for many bakers. The magnetic flip-down lid of the box allows easy access to your bread and ensures minimal airflow. Operating the bread box is also easy. The large bread box is visually appealing and would be a great collectible item that serves a practical purpose. Whether you have a French country home or contemporary styled-home, this bread box will easily complement your décor. The Mountain Woods is not a roll-top bread box. However, its compact design minimizes the amount of space it takes on the countertop. Moreover, it is quite spacious for your bread and other baked goods. Finally, the rattan-covered door improves breathability. The Now Designs Bread Bin is gorgeous, sleek, and will complement any retro-styled kitchen. The modern box is Tiffany Blue in color with some hints of retro. The bread bin is made of durable, powder-coated steel, has an easy swing lid/door, and allows sufficient air circulation inside through some small holes at the back. The contemporary design of the Now Designs Bread Bin makes it stand out. The box is compact and perfect for a small kitchen and has an easy-to-open lid/swing door. When you store your bread and other baked goods in the box, you won’t have to worry about bugs or pests getting to them. There are different ways of preserving bread. For example, you can freeze and store the bread in a bag in your chest freezer to prevent moisture build-up. However, keeping bread inside a bag, in fact, makes it easy for moisture to build up and mold to grow. The best way of keeping your bread fresh for longer is by storing it in a bread box. Bread boxes do not require any training to use. You simply need to put your bread inside them and shut the lids. The boxes are made from different materials, including stainless steel and wood. Moreover, they come in various styles and colors to match your kitchen décor. Bread boxes not only help to keep the bread fresh by slowing down the formation of mold but also keep away pests and bugs. The best bread boxes for homemade bread are those made from wood. These boxes do not attract heat like is the case with metal boxes. Below are a couple of tips to keep in mind when you want to store baked goods in a bread storage box. If you want to store baguettes, confirm the size of your box. You probably would need to cut the load in half or thirds if it is too long for the box. Tall bread may also have to be cut to fit in the bread box. However, the longevity of the bread will not reduce simply because you have cut it. Avoid overfilling the bread box with your baked goods. There should be space to allow sufficient flow of air to keep the bread fresh. After baking your homemade bread, wait for it to cool down before placing it in the box. Storing the bread while it is still warm will make it prone to molding faster. Most bread boxes have tiny air holes either on the top or at the back. The air flowing through these holes helps to reduce the amount of condensation. This air is not sufficient to cause mold. Make sure the bread box lid is tightly closed. If you have a small kitchen, a bread box can help to create more space on the countertops as you can store your baked goods inside the bin. If you live in an area with erratic weather (for example, the temperature fluctuates daily), the best breadbox for homemade bread for you would be a wooden one. An alternative to wooden bread bins would be plastic ones. Ideally, you should avoid metal bread boxes as their temperature can fluctuate based on the weather, and this can make the bread to spoil faster. Think of the number of baked goods you would be storing in your bread bin. If you have a large countertop, do not be afraid to choose a large bread box. These boxes will save you a lot of space and can serve multiple purposes.